San Francisco, Oct. 4, 2018 – The Pacific Nuclear Council (PNC), an organization composed of nuclear energy societies and associations around the Pacific Rim, invested its officers for 2018 to 2020. 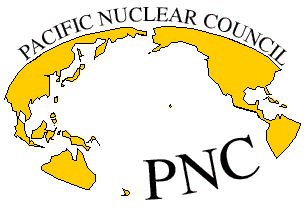 Las Vegas, Nevada, Nov. 6, 2016 – The Pacific Nuclear Council (PNC), an organization composed of nuclear energy societies and associations around the Pacific Rim, today announced its officers for 2016 to 2018. April, 2016 – After the events in March 2011 following the earthquake and tsunami in northeast Japan, the Pacific Nuclear Council (PNC) recognized that its members were uniquely affected by the ongoing crisis and cleanup. Vancouver, British Columbia, August 28, 2014 – A study conducted by the Pacific Nuclear Council (PNC) and Potomac Communications Group, Inc. (PCG) revealed a continued need for outreach to support the growth of the nuclear energy industry in Pacific Rim nations. Vancouver, British Columbia, August 27, 2014 – The Pacific Nuclear Council (PNC), an organization composed of nuclear energy societies and associations around the Pacific Rim, today announced the installation of its officers for 2014 – 2016. Washington and Busan, Korea, October 23, 2013 – The Pacific Nuclear Council has issued a call for papers for the 2014 Pacific Basic Nuclear Conference (PBNC-­‐2014), to be held in Vancouver, Canada in August 2014. Abstracts of 150-­‐250 words are due for submission by October 31, 2013.